Our group finally managed to get a session played after the week of problems with corrupted saved games. I did manage to introduce a couple of others (while trying to improve the DM code), but after recognizing the issue, we pulled the two XML files causing the leveling problems and managed to play a full 1 hour and 17 minutes. This was slightly shorter than we set out to play, but a GUI issue, followed by a computer problem by the guy on the WAN (Windows wanted to update), brought us to an early night. So, without more intro, here follows the fixes, updates and adventure! 1) CORRUPTING XML FILES: The first problem we encountered was shortly after Graham decided to bring on board a fighter (a dwarf called Flint) to replace Aeriol, the elf wizard companion. The process went according to plan until Graham went to level the PC, to catch up with the current level of PCs. At which point the Level Up button refused to work for the PC, and when he did manage to get a little further, the PC's skill points were corrupted, preventing the player from taking the PC any further. To keep the game moving, I quickly decided to remove two potentially offending XML files (one that altered the DM Party Bar to show PC hit points and another to disable the Class Recommend button on the Level Up screens). Once removed from all computers and reloaded, the PC leveled fine. However, I can add that on later testing, it appears another roster PC has been corrupted, but thankfully, is an easy fix because we have the original BIC that can be re-imported into the game. Suffice to say, these two XML files were only added last week, and then only for cosmetic alterations, and so I decided to leave them out now. 2) TB COMBAT EQUIPPING: While not a show-stopper of a problem, it was an issue I wanted to fix, as this problem caused the Turn-Based combat system to unpause for longer than expected when using the 0.1 second advancement (using the Show Info GUI box) or when swapping the equipped weapon. Both of these very brief "unpause" options clashed with the point that you are not meant to pause again in a TB round after unpausing. Therefore, I needed to add some variable checks to allow these options during a TB paused moment in the game. They are now added and work well. On a side note, the TB Combat System now works very well in MP, as well as SP since I improved the code a couple of weeks back. 3) CHOICE GUI CLOSING: The bug that led to the session ending was due to a GUI that was presented to all players in the session. It was only "active" to the lead player who caused the GUI to be displayed. After taking action with the GUI, the GUI then closed for the player taking the action, but, unfortunately, I had not yet coded to close for a MP environment (even though I had coded it to open for a MP one). Therefore, the GUI remained in place and could not even be escaped (that was the correct nature of this GUI), and so the game had to be saved and reloaded. Unfortunately, my friend on the WAN who was presented with the GUI issue has been having his own issues with his computer not starting NWN properly sometimes. This happened tonight; and was probably due to the fact that Windows required an update and restart. So, we decided that would be it for the night. 4) MAIN PC FOLLOW ERROR (INTERCEPTED): While testing, I noted that the Main PC would NOT always listen to (hear) commands shouted by the player when possessing a created PC. I had to go back to an older build to help locate the issue. It appeared to be related to some "new" code I had added to help prevent another follow issue. Once I reinstated the older code, it fixed the new problem, but, thankfully, in testing to date, the old problem has not returned! Go figure. 5) OTHER MINOR FIXES: Other fixes included: A return to the DM Map failing to open, which I hope I have addressed this time; DM stats figures showing incorrectly fixed; a return of the double Party Bar after a toggle, which again, I hope to have addressed this time; and incorrect GAME PAUSE message for the DM. There was only one update this week (which could be called a fix I suppose): I changed one variable to ensure that every member of the party present was compared to when giving feedback on the PARTY CRAFT tab on the character sheet. 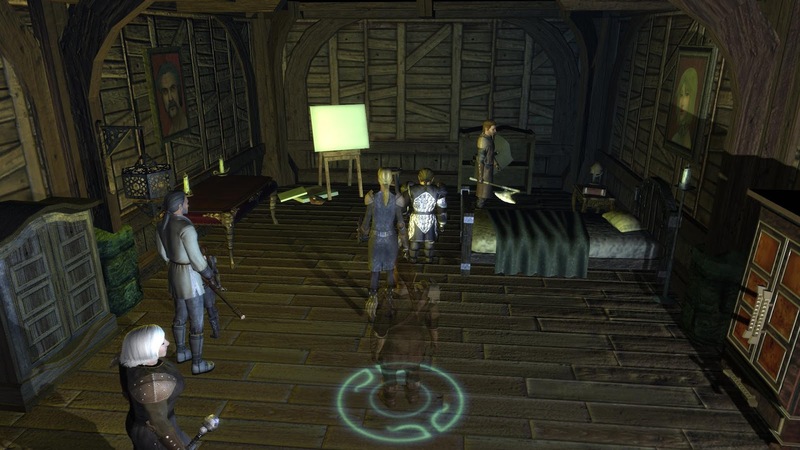 Previously, the crafting scores only checked the values of the PCs that a player controlled, as opposed to those also controlled by another player. As the tab is entitled "PARTY" and already returned the best/highest feat in the party, it was only proper to do the same with party skills as well. The Adventure Continues ... 6. The Heroes Go Batty! Helden felt more comfortable knowing they had the backing of another fighter in the group before they faced .... the Belfry Bats! To be fully prepared, the heroes spent what little gold they had remaining to help equip Flint, the sturdy dwarf, with better armour and weapons. Then, weapons in hand, the heroes strode boldly towards the Sanctuary. Pausing for just one moment at the notice that warned about carrying garlic to ward off the bats, Helden pushed forward boldly, preferring his axe to defeat the creatures than the waft of an herb. No sooner had he led his party to the upper floor of the Sanctuary when the group were instantly swamped by half a dozen bats. Thankfully, both Helden and Flint made up for the lack of garlic and along with Myara and her bow, the heroes swiftly disposed of the belfry squatting creatures. "It's bat poo!" said Myara as she examined the guano near the bell rope, which Helden decided to pull, much to Orechin's annoyance. Clearing up the remains of the bats, the heroes discovered their first Life Essence: the mystical substance they had recently learned about in the book they had recently found. Furthermore, Orechin was pleased with the heroes work and paid them with 2 healing potions each. After discussing the picture of the woman they had found on the murder victim, Orechin asked the heroes to confirm with Kathy at the Apothecary who he believed it may be: her daughter! He also advised caution when dealing with Kathy, as it appeared that Sophie had also been murdered only a couple of weeks earlier. A few minutes later, after confirming with Kathy that the woman in the picture was her daughter, the heroes found themselves wrapped up in a deeper mystery involving a man called Theodore Peach (the man who was recently murdered) who, according to Sophie's diary, was set to wed her in the near future. To this end, the man, affectionately called "Peachy" by Sophie had been collecting gold for their wedding and bringing it to Sophie. Sophie, it seemed, had gone to the trouble of sculpturing a statue with a secret compartment, where she hid the gold, which nobody knew about, not even "Peachy". In the same diary, Sophie spoke of concerns regarding two people: Sandy, the local serving girl at the Bloated Buckle Inn and Doug Millerson, estranged son of Frank Millerson of the local barn, who had caught her discreetly speaking with Theodore, or the statue. Now both Sophie and Theodore are dead, and the heroes also now have two suspects to investigate. After reporting their suspicions to Orechin, the local clergyman encouraged the heroes to follow up on the suspects and try to learn the truth. He said that he would catch up with them at the tavern after informing the authorities of their discoveries. Stepping out of the Sanctuary into the warm evening breeze, the heroes looked at each other before deciding to check a theory they had about the gold that Sophie wrote about and the secret compartment that was built into the statue. So, before heading to the tavern to confront their suspects, they decided to head to the graveyard to look for more evidence of secreted gold! The graveyard was only a few paces from the sanctuary, and the statue stood out quite prominently. "Leave this to me," said Myara, and the halfling rogue stepped up to the statue and placed her arms in the statue's arms, as she had understood from Sophie's diary as the means of opening the secret department. There was a small click, and the statue revealed its secret: a large pouch of gold! Myara, paused for just a few moments, a moral dilemma screaming in her mind, not helped by Helden's eager look at the sight of the treasure: Do we keep the gold and say nothing, or take it to Kathy? Thankfully, the heroes passed the test of conscience and decided to keep the gold to one side for Kathy and not for themselves. TOTAL SESSION TIME (UNPAUSED): 1 Hrs 17 Minutes. GAME TIME SINCE START: 7 Hours 52 Minutes.